Hi there, it's me the K.i.T (Knight in Training). After our lovely day away in Wales I got to go back there last week. I spent some time with Spotty, we had lots of fun. We had an accident in the car on the way there & mummy is going to have to pay to repair his car which she's not happy about as he was a nasty little man. I now have been licking my paws, this has given me 3 lick granulomas which are very itchy, so mummy has bought me a satellite dish, it doesn't seem to be picking up any good channels though. I haven't figured out yet how to get around, I seem to keep getting stuck. Hopefully my paws will get better quickly, mummy is putting special creams on them to help. Well we had a lovely holiday (even if it was only 3 days-2 spent driving). We took the chariot all the way to Wales to see Daddy on his 10th birthday, it was a lovely day. However it didn't start out too well as we hit traffic works on the motorway & I had a little "whoops" moment. The hotel was quite nice but very noisy so I didn't get much sleep. But the following day we made tracks to the birthday party. We had lots of fun & treats and really enjoyed ourselves. The following day the Ogre took us to a beautiful place for a lovely walk. 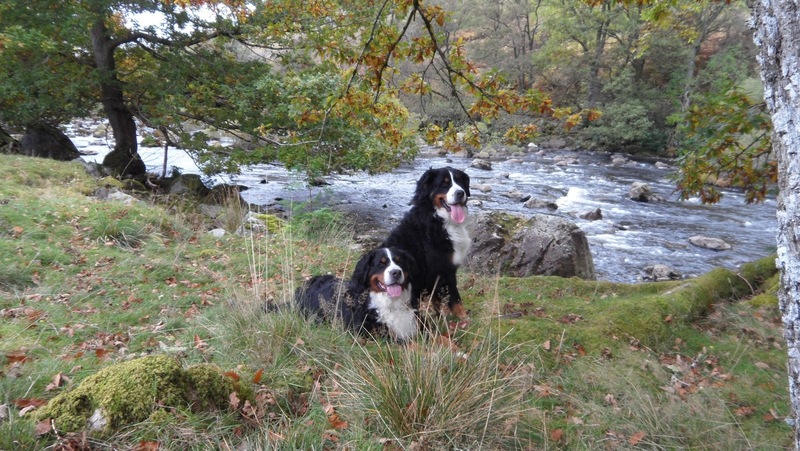 The clocks have gone back to normal time so it's getting dark really early, no more long walks until the springtime.